You can learn a lot from tax records. Consider Samuel Byrd. This Samuel Byrd was born in Tennessee on April 14, 1814. He was the son of David Byrd and Jane Morehead. His grandparents were Richard and Elizabeth Buster Byrd. He (this Samuel Byrd) is one of my great, great grandfathers. I say “this” Samuel Byrd because he’s often confused with his son Samuel Zedock Byrd (1852 – 1938) by people building online trees. We know much about this son. I visited his and his second wife’s grave a few weeks ago in Collin County, Texas. I also, quite by accident, came across his first wife’s grave in a Hunt County, Texas cemetery while looking for another great, great grandfather. His death certificate records his name as S.Z. Byrd. There’s a good article about him and his family in a book on Collin County families. (Collin County Texas Families, Alice Ellison Pitts and Minnie Pitts Champ; Cutis Media, Hurst, Texas; pages 69, 70.) The article was written by Bryan Vicars, a proud family descendant. I can’t prove some of the statements in the article (In fact, I can disprove some and doubt others. ), but I do know “this” is Samuel Zedock Byrd, the son of my great, great grandfather Samuel Byrd. I’m very interested in “my” Samuel Byrd. I know so little about him. I know more about his wife Elizabeth Horn Byrd. I know a lot more about his other children. I’ve spent considerable time trying to know him yet he remains distant and illusive to me. Some say Samuel Byrd migrated to Texas in the middle 1850’s. Someone reported on Find a Grave that he died September 11, 1857 and is buried in historic Pecan Grove Cemetery in McKinney, Texas. I cannot confirm either of those statements. The cemetery association was “officially” formed in or after 1870. It is believed however that people have been buried in those grounds since the 1850’s. According to land records, the land was originally owned by the McFarland and then fairly soon purchased by the Davis Family. Both of these families previously lived in Wilson County, Tennessee before migrating to Texas. It is believed by some that both Jeremiah and Elizabeth Horn were born in Wilson County. Could their families, the Horns, McFarlands and Davis’s, known each other in Tennessee? I know my great, great grandmother Elizabeth is buried in Pecan Grove. I know her second husband Thomas Rodman is buried beside her. I once thought my 2 x great grandfather Samuel was buried there in a vacant space on the other side of Elizabeth. I no longer do. Here are some reasons. There is no record of his burial there. He is not in any plot records including the hand written originals in the cemetery’s safe. The cemetery personnel believe someone may be buried in that vacant space but have no way of knowing who. It’s not in the records. The plot is actually still for sale. I give more weight to Samuel and Elizabeth’s six year old son Jeremiah David Byrd being buried there in 1861 and may explain Elizabeth’s decision to return here to bury her second husband and later have her children bury her there. The name on those occupied plot deeds is Elizabeth Rodman dated from the 1870s. She only purchased 2 plots when she certainly could have afforded 3 and a headstone for her first husband. (BTW, my “abt” and “aft” date of 1855 for Samuel’s death date on my family tree is based on Jeremiah David’s 1855 birth date. There are no records of any kind for “this” Samuel Byrd in the State of Texas. No census. No probate. No obituaries. No bank records. No land records. No tax records. There is nothing you would expect from a man settling in to a new place…or dying! And, I can find some or all of these for Elizabeth and her children in Texas beginning in 1860. Death and taxes are the two certain things in life. The tax man always cometh. When I thought about this, I decided to firm up my suppositions with “negative proof”. I would need to show myself there is no evidence “my’ Samuel Byrd ever arrived in Texas – tax records. Samuel Byrd was never to my knowledge, and I searched four likely counties, charged a tax in Texas. That means no taxes for land, occupation, income, etc. None. But, here’s something interesting. I began tracking Samuel’s father-in-law Jeremiah Horn and his sons George and John’s tax records. 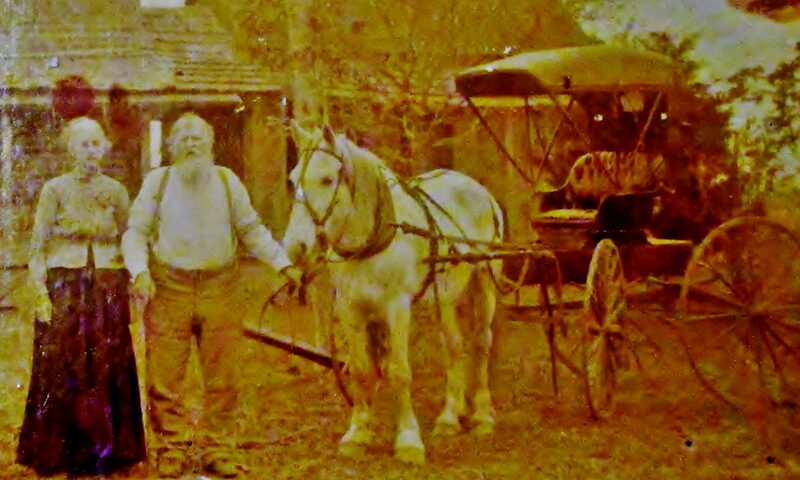 They began paying taxes in 1846 in Collin County and continued to pay taxes through 1857. These included taxes on their wagons and we know they were teamsters and had a freight business. Then in 1858, I lost them and did not pick them up again until 1860. Why? I don’t know. Perhaps it was an oversight on my part. But it wasn’t just Jeremiah, it was Jeremiah and George and John. All three owned original survey land in Collin County. OK, I don’t know what happened. Here’s something I know. In the 1860 Federal Census, Elizabeth and her children are living in Collin County near the Lebanon Post Office. She is the head of her household and works as a weaver. The community of Lebanon was named after Lebanon, Tennessee the previous home of many of the early settlers in this part of Collin County. That’s Lebanon in Wilson County, Tennessee. She lived about nine miles south of her father’s home place and about five miles west of another property once surveyed for him. She was about nine miles north of her “missing” husband’s cousin James Byrd in north Dallas County and about eleven miles east of her son Pleasant Wesley’s future wife’s family in Denton County. What if Samuel Byrd, yes “that” one, died in Alabama? What if the Horns made the trip to where Elizabeth was living in order to help her, her five girls and young sons, finish crops, sale land, pack up and make the move to Texas in 1859? I don’t know. I really don’t. I’m open to new documented evidence. But here’s what I know so far…the Texas taxman never came for Samuel Byrd, but death did. Have you ever used tax records in your family history research? Interested? Check out Susan Jackman’s great article on using taxes in your genealogical research. Interesting article, Gary! Your theory sounds reasonable. There is a similar situation in my family. The husband died of complications of measles in the civil war, and his widow and children moved with her parents and siblings to Calloway county before 1870. In that case, the trail is pretty obvious, but I can see that just a few years earlier, it could have been much less so, particularly if the events were closer together,. Sounds like you need another road trip to Tennesseean! This is very interesting and I would like to know more. My grandfather was Ira Byrd. His great grandfather was Samuel Byrd. I am trying to piece together as much as I can about both Samuel and Elizabeth. Can you tell me more about Ira? Birth date and place? Spouse’s name, etc. ?